Please submit your views on the draft neighbourhood plan by 31st December 2018. Click here to complete the online form or Email your views to clerk@lavendonpc.org. 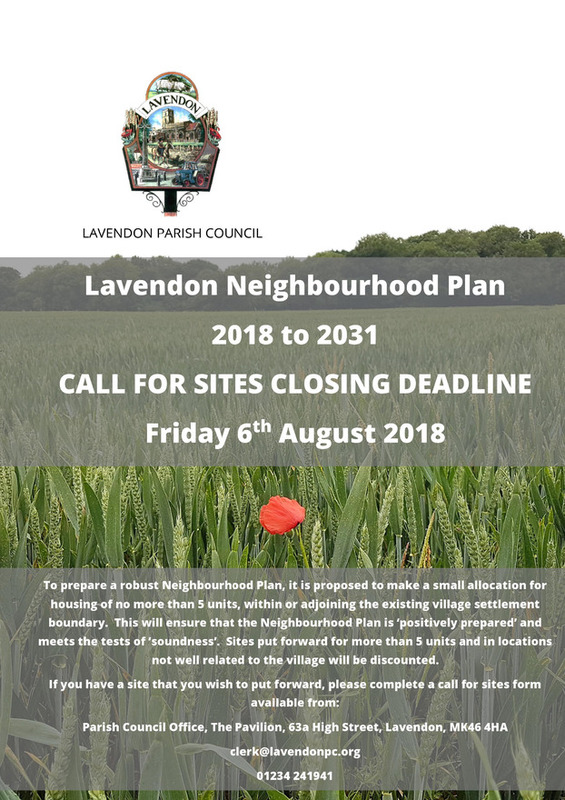 The Lavendon Neighbourhood Plan is being prepared at present and will once adopted be used to determine planning applications within our village. A significant amount of new housing has been permitted recently, including a large site of 95 dwellings at appeal. Part of the focus of the Neighbourhood Plan will be the integration of this new development into the village, to secure the best outcomes we can for our community. To prepare a robust Neighbourhood Plan, it is proposed to make a small allocation for housing of no more than 5 units, within or adjoining the existing village settlement boundary. This will ensure that the Neighbourhood Plan is ‘positively prepared’ and meets the tests of ‘soundness’. Sites put forward for more than 5 units and in locations not well related to the village will be discounted. Please click here to download the form to provide supporting information on sites suggested for future development. The response to the neighbourhood plan questionnaire has been terrific but the more information that we receive the better as this will help us develop a robust plan for the village. As we are still ploughing through the responses and collating the information we are happy to receive questionnaires back up until the year end so if you haven't already responded please do so as soon as you can. What's the point of completing a questionaire? To have your say about the future shape of the village....your opinions count. We are applying for a grant to cover the cost of developing the plan and we have volunteers from the village helping to make this happen. If you have a question feel free to ask. We have, to date, received back just over 11% of all questionnaires distributed. Please make sure that you return your Neighborhood plan questionnaire by 15th December to have your say on the future of Lavendon. Today we are starting to distribute the Neighbourhood Plan questionnaire. Each adult needs to complete a separate questionnaire and return it to the Parish Office at the pavilion. If you could return them as soon as possible as this is a mammoth task so having early returns would help us to collate the data for analysis. This is your chance to have a say about how your village develops so please have your say. The process for creating a neighbourhood plan for Lavendon has started and we will be looking to you for advice, opinions and help with creating the plan for the future of Lavendon. Currently we are forming a steering group and if you would like to be involved in this group please contact Jane Brushwood at the parish council office. During this process we will keep you informed and post documentation in this page. There will be an open day on Saturday 16th September 2017 from 10am to 3pm, at the pavilion, for you to give your input into the early stages of the neighbourhood plan. Come along to let us know what your aspirations are for village so that we can start the process of formulating the plan for the future of our community.